It is the annual bulletin of World Comics India which not only enlists the yearly events undertaken but presents the creations and artistry of our world wide spread trainers showing their individualized styles of comics making. In its unique creative fashion it brings to you stories and activities undertaken by World Comics in different parts of the world. This 20 page bulletin encompasses unique ideas showing how comics very innovatively have been used for research purposes. It shows how time and again the medium has been used as both development communication tool and educational tool especially to teach differently abled. World Comics India has spread its wings across the globe; this medium is thus practiced worldwide. This bulletin presents to you a glimpse of same. It has stories from different countries like Brazil, Pakistan, Thailand, Japan etc and in different languages too. It just doesn’t end here J this yearly bulletin also has comics made by our different participants on various social issues. 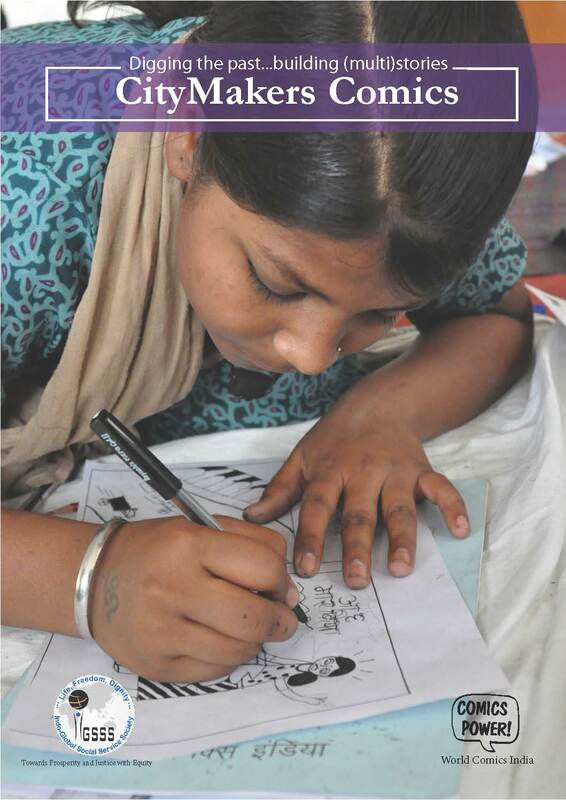 It has comics created by homeless and comics created by Kabu, a girl from Rajasthan and a very talented comics trainer who prevented not only her early marriage but saved lives of many other girls by spreading awareness on Girl Child Rights and importance of education for girls. World comics India through grassroots comics has always believed in providing voices and space of expression to everyone, through this bulletin too it tries to present both the canon of flair and facer of its participants and trainers both indigenously and globally. Story telling has always instrumental both in carrying forward the essence of an individual life and the oral traditions associated with it. Every time we hear a story automatically images start building in our mind. Thus reflecting how images become essential in understanding and connecting to a story, as it is these images which create virtual reality. Conducting workshops nationwide WCI has come to the conclusion that narrating one’s story through medium of picture itself is indeed an effective and fascinating way of getting across one’s message. Also comics have been experimented with as an alternate medium of communication keeping in mind the widespread illiteracy amongst our rural population. From Bikaner to Aizwal, from Chandigarh to Tindivanam, these workshops were conducted in which people of the village and those who understood the rural surroundings participated. The idea behind the workshop was to encourage visual communication. This book –VOICES FROM THE FIELD is a harbinger of people’s experiences and through the visual communication-comics they have articulated their stories. Voices from the field is an attempt made to showcase how the participants of the nationwide conducted workshops have expressed themselves by means of comics. Each workshop provided World Comics India a rich mosaic of different styles of expressions, with the participants fashioning their own lines and figures tell their own stories. The same can be seen in the stories presented in this book ,there are comics from Assam, Bihar, Chandigarh, Chhattisgarh, Delhi, Jharkhand, Karnataka , Maharashtra, Madhya Pradesh ,Manipur ,Mizoram, Rajasthan And Tamil Nadu in it. All of us have read about the food chains in our lives at some point or the other whatever we consume comes through us after passing from various steps and people similarly whatever activity we perform in our day to day lives cannot be performed without the accord of other’s help. Our every activity is successfully carried out after the support of people around us. However we fail to notice and acknowledge these people. The street vendors, the rag picker, daily wage workers, rickshaw pullers etc are such people without their support we cannot carry our daily life so smoothly and comfortably. They are the ones who make our comfort zones in city, they are the CITYMAKERS. However though they keep every one’s life smooth their own dreams due to which they migrated to cities remain unfulfilled. DIGGING THE PAST … BUILDING (MULTI)STORIES- CITY MAKERS COMICS is a comics anthology which speaks about these unfulfilled dreams ,the plight and the problems of CITYMAKERS in their own voice and language. 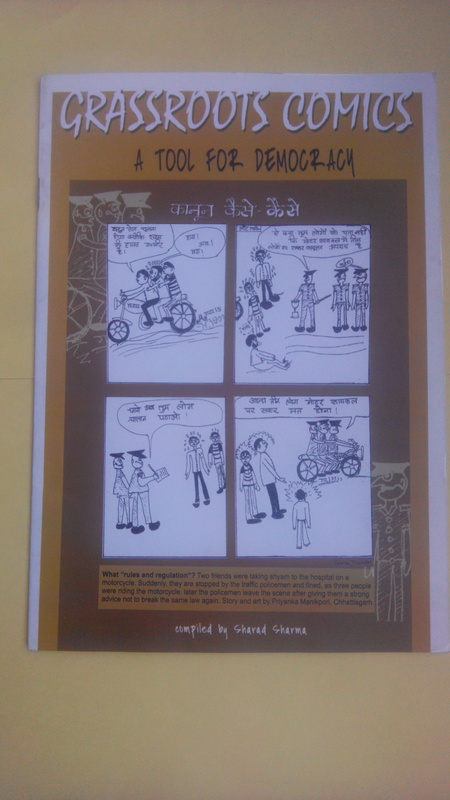 It is a compilation of wall-poster comics produced by CityMakers of Delhi. A number of Indo-Global Social Service Society activists also shared their experiences through this powerful medium of communication. IGSSS and WCI collaborated to highlight the issues of CityMakers. The idea behind the collaboration was to gather first hand experiences of CityMakers and to provide a tool of communication and self-expression to the people who are the backbone of the city. Interested CityMakers were also trained as trainers so that they could educate more city makers in this art of communication. Another important objective of the workshop was to collect the stories of the CityMakers and put them together in a book form so that it can be shared with others. This comics anthology is a result of such objective and effort. The given stories will also help in stereotypes against the migrant communities. This publication is one of the most unique collection of the experiences earned by Nida Shams –Founder Of World Comics Network-Pakistan, during several workshops conducted by her in the country .This anthology is a result of a month long workshop conducted in Karachi Women’s Jail encompassing their unique individual experiences in jail some humorous, some gloomy .Given comics in this anthology speak of the lives of women prisoners in Karachi women jail in their own language. However it was not as simple to take pen and paper in jail and motivate inmates to share their painful stories and then ask them to make comics on the same. These women were mothers, daughters and sisters but not a free citizen and lodged here for several months and even years. We had participants of every age and even children of these inmates too took part in it. There lives a few stories behind the bar- which are documented in comics form here to let the outside world understand the plight of these women. This 36- page black and white comics anthology in Urdu (having English translation) has been authored by Nida Shams. These black and white lines are powerful examples of self-expression and in recent years grassroots comics has been successful in reaching to the people who need it the most. Terrorism has been a very major phenomenon disturbing the peace of the planet today. Every second person on the street is found talking about this but is unaware of the factual information and carry stereotypes. This is a major divide in the society today. Bridging this gap, Terrorism Explained – a graphic account, co-authored by Ram Punyani and Sharad Sharma was launched. “Terrorism Explained’ is a comic book, which deals with the theme of Terrorist Violence, globally and locally. The book narrates some of the major events related to terrorist acts, goes on to discuss the stereotypes associated with terrorism, takes up the genesis of global terror with politics of oil, takes up Hindutva terrorism and the ideology guiding that. This theme unfolds with illustrative visuals. You can also buy the book online! India has been suffering from the rise of communal violence and terrorist violence from the last three decades. In this violence unimaginable number of innocents are killed. Religion’s moral values are bypassed and issues of religious identity are abused to whip up violence. There is an urgent need to talk about this in the open. Communalism Explained! – A Graphic Account’ is a book that illustrates in the form of graphics the phenomenon of communalism in India co-authored by Ram Punyani and Sharad Sharma. BOLTI LAKEERAIN: If you think comics is just western art focused on superheroes, you should change your perception now. Comics can also be used to portray indigenous issues this can be aptly seen in Pakistan’s first comics anthology – BOLTI LAKEERAIN. It is a reflection of comics stories from Pakistan. Co-edited by Sharad Sharma and Nida Shams, the book brings out different issues from the land of Pakistan. It primarily talks about Terrorism, Water, Electricity and other issues close to the people of Pakistan. These comics are created by the common people living in distinct places; e.g. from Kakapeer to Kashmir in Pakistan. In these comics they have narrated real stories of their day to day life. These are not merely ink lines sketched on paper aimlessly but each one narrates a story with a significant meaning behind it. It is an initiative true to its name; the lines speak from the heart of Pakistan. TOLERANCE- this book is a compilation of wall poster comics drawn by ordinary people. These comics were produced during a three day grassroots comics workshop organized by Human Rights Commission of Pakistan and World Comics Network- Pakistan in Karachi. The theme for the workshop was the need for tolerance. This was a most appropriate issue for a group activity involving people from diverse backgrounds, religions and different age groups. The workshop was held in the belief that knowing more about others can help reduce mistrust and break stereotypical conceptions, as well as promote tolerance and respect for others. These objectives may sound serious and one could say it is not a child’s play .but we believe that one can find simple solutions for complex problems. At the workshop we tried to communicate through simple story telling. Participants from different religious backgrounds and age group shared their personal stories on the issue of tolerance. Each one of them made comics on their personal experience while following different faiths. The book was compiled by Nida Shams , founder of WCN-P and has foreword by Mr. I.A.Rehman, Secretary-General HRCP and was published by Human Rights Commission of Pakistan. Half World Four Frames is published by World Comics India in 2007. It is a comics book based on the issue of Gender. 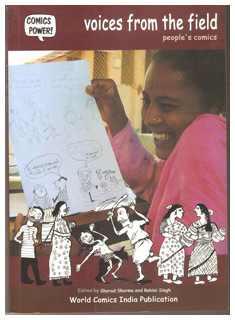 130 comics from India, Pakistan and Sri Lanka tell different stories of women in different social and culture situations. Comics from Pakistan present the position of women in matters like right to divorce, honour killings, impoverishment. Sri Lankan comics shows issues like exploitation at work place, domestic violence, gender discrimination. The book is not only a depiction of problems but also presents the cases where the women of the community took a forefront in dealing with water crises or demanding economic improvement in stone quarry. The book also has comics where the women took up cudgels to stop the distribution of illegal liquor or where the women fought against the goons who intimidated the women of the village. UNDERSTANDING GANDHI – This book is a result of a ten days comics campaign organized in collaboration with Gandhi Smriti for children. All the stories are a compilation of those which came up in campaigns. The participants were mainly from two childrens home of Delhi who created comics on the life of Mahatma Gandhi and his values in contemporary times. These stories are not only inspiring but also full of drama and a variety of drawings. Recently all these comics were compiled and published in two books titled Understanding Gandhi (English) and Gandhi se mulakat (Hindi). Elaborating further on the reach and the rage of development WORLD COMICS INDIA has developed PARALLEL LINES. 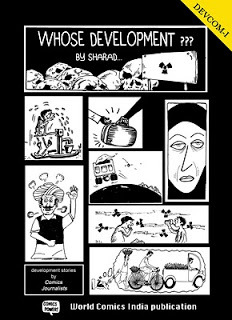 Parallel Lines (English) and Samanantar Rekhayein (Hindi) are second in the series of Devcom (development comics) unleashing more and more facets of the destruction which development has created. Starting with a forward by Polyp, a British cartoonist based in Manchester, these comics describe development from where the earlier ones left and take it a level further, not just in terms of description but visual aesthetics and storytelling techniques as well. Every story has a different art as well as narration style owing to the different backgrounds of the artists. Interestingly most of them have learnt art over a period of time while working with WCI and their local organizations neither of them is a professionally trained artist. All stories have come not only from different states but encompass different issues ranging from social movements to the depression and discrimination students face in the contemporary world where talent is not measured by the art an individual has learnt but by the courses which fetch maximum money. The story of Amrith Basumatary and Siddharth and Sundar Mohan Murmur are such. Amrith an artist from Assam has reflected on Bodo Movement and the struggle people has undertaken to keep this movement alive. Siddharth have thrown light not on social movements but on individual struggles of students in the world of development where students are pressurized to undertake money fetching course and not relinquish their art. He does so by etching out the conflict in a father-son relationship in the times of blinding commercialization. Sunder Mohan Murmu has shown the regional and racial discrimination students are facing however he does not limit to the local influence of such matters but instead connects it to the attacks on the Indian students in Australia and thus makes a strong statement on the politics of racism in contemporary times. Stories have also been contributed by Rajeswari and Lakhendra Nayak. Rajeswari is a research scholar who through her story ‘Common Slave Games’ she brings us face to face with the ugly truth behind the beautification of the national capital high in spirits with the Commonwealth Games. Lakhendra Nayak, a lawyer by profession has documented the victory of farmers over BT cotton Madhya Pradesh. He understands the importance of poor farmers winning over a gargantuan MNC in the Indian Judicial System and reckons this victory as an achievement and wants this story to act as an inspiring example to all those suffering at the hand of powers mightier than themselves. Contributed by comics journalists these stories are a result of an yearlong effort. They are a result of an extensive and intense discussion and workshops on – the art of making comics, visualization, frame inking, texture etc.The contributors also had prolonged discussions on their stories where each had to defend their story from the critical view of the rest as well as accept suggestions. This book has been compiled by Sharad Sharma and it is a World Comics India publication. DEVELOPMENT/ VIKAS – though seems to be a term very commonly used it has always had different connotations attached to it. Everyone has different needs and aspirations associated with it .Everyone wants progress which would add on to their comfort zone too preoccupied by our own vicious circle of comfort that we fail to understand how this demon of development is engulfing various lives .This development has come at the cost of displacement of people from their own villages. In name of this development people has lost their loved ones. It has taken toll on people’s happiness and this development has also closed eyes of people towards various forms of discrimination still being practiced. WORLD COMICS INDIA has made an attempt to discover the destruction of development through sufferers own eyes and in their own language. Whose Development (English) and Vikaskalhe Vipreet Buddhi (Hindi) are first comic anthologies on development published by World Comics India. It comprises of stories from Jharkhand showing how developmental projects are encroaching the lives of adivasis. There is story from Assam which shows fisherman’s harsh life conditions while the Goa story is about big company’s encroachment into tourism. Kolkata story is about slow moving tram and Rajasthan story is about plight of a Dalit man. Be it the story of the fisherman from Assam or the helpless woman from Kashmir; the deleterious effects of tourism in Goa or the consequences of Uranium mining in Jaduguda; the tale of the Kolkata tram or the tribals of Jharkhand, we have endeavored to portray the picture as realistically as possible. 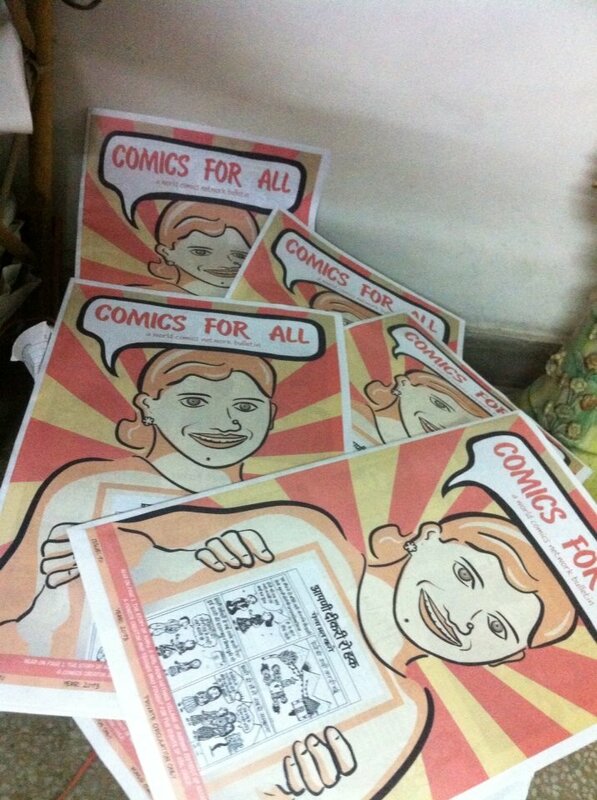 Unlike the mainstream comics the Grassroots Comics are made by people themselves which make them different. This is a unique anthology in the sense that these comics are not drawn by professional artists but social activists and students from the fields of mass communication and social work. World Comics gave a voice to the common people who in turn beautifully presented their understanding of development through humor, wit and satire in these comics. These people are Comics Journalists. This comic’s book is also an example of comics journalism at very local level. Since many years World Comics has trained a multitude of people as trainers and professional comics artists. The idea has been to collect the stories about development and assign this work to such comic’s activists who will report from their own areas as Comics Correspondents. The activists use these comics for communication purposes in their respective organization and area. The motive behind this anthology has been to trace the reach and rage of development through people. It traces how the common people of India perceive development; what it actually means to them, or if at all it has any significance for them. These stories have been collected from Jharkhand, Assam, Kashmir, Rajasthan and many other parts of the country present a reflection of the accomplishments of development there. This book has been compiled by Sharad Sharma and it is a World Comics India publication. A community comic book on issues of MSM and Transgender –EK ALAG CHITRA KATHA is the first LGBT comics book launched in Mumbai. This book is an outcome of World Comics India and Humsafar Trust -an NGO dealing with the rights of sexual minorities in India, collaboration. Humsafar Trust made the book after Sharad Sharma (of World Comics India) ran a three-day workshop at Humsafar’s office in Vakola, Santacruz (E).There he trained grassroots activists in recounting anecdotes and sketching them into comics. This workshop was attended by 15 outreach workers from the MSM and transgender community working on issues of sexuality, health and human rights of sexual minorities .The workshop helped develop 15 stories of human interest based on experiences of outreach workers. This book is result of an effort undertaken to use comics as a tool to address issues faced by MSM and TG community in India. The stories produced in this comic book were outputs of the workshop and the same have been reproduced without any change. This 24 pages book is both in both languages English and Hindi and has been published by Humsafar Trust. Grassroots Comics is published by the Ministry for Foreign Affairs of Finland in May 2007. The material for the book is compiled from the experiences of World Comics Finland and World Comics India with the co-operation of many different organizations, movements and activists. 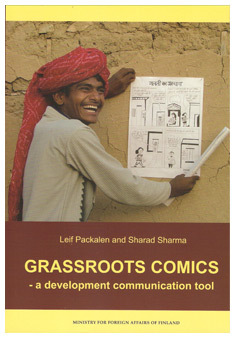 The book comprises of examples of grassroots comics, practical manuals and photographs from Asia, Africa and other countries. The book has a lot of practical advice on how to go about making grassroots comics, how to organize comics workshops, etc. It has 160 pages and is available in both English and Hindi. The complete book is available online as a pdf-file. The file can be downloaded from this website or from the Ministry’s website. The file is 15 MB so it can take several minutes to download, depending on the speed of your connection. This comics book is a result of a compilation done by Sharad Sharma of comics created during and after several workshops organized by World Comics. Comics showcased in this book are first voices of the common people. The creators of these comics are not professional artists but people living in different parts of the globe from Brazil to Pakistan and UK to Sri Lanka. The comics published in this book were also exhibited during a weeklong workshop exhibition in IIC Delhi. In this 32 page publication there are 30 comics from 12 different countries. World Comics India published a set of 8- pager comics, which can be made from double sided photocopy of one A-4 size paper. These comics highlighted issues of corporal punishment, the effects of bandh and protests on the lives of common people, terrorism, and dream of a poor young boy. Two of the comics also share the power grassroots comics give to a common man. 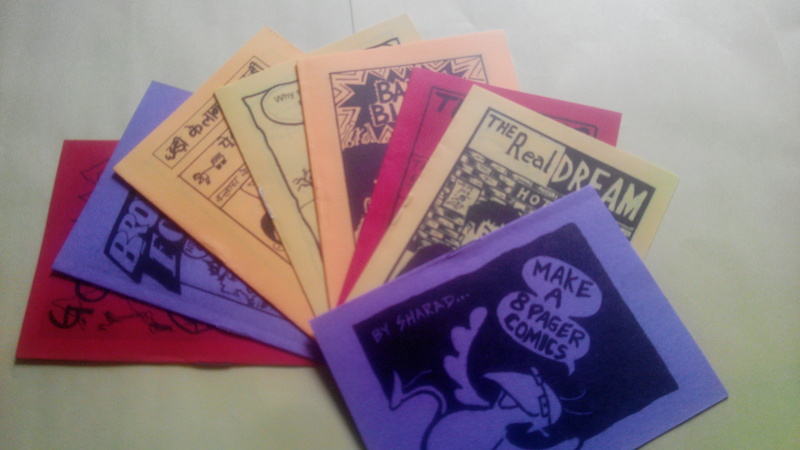 One of the booklet is about how to make your own 8 pager comics booklet. 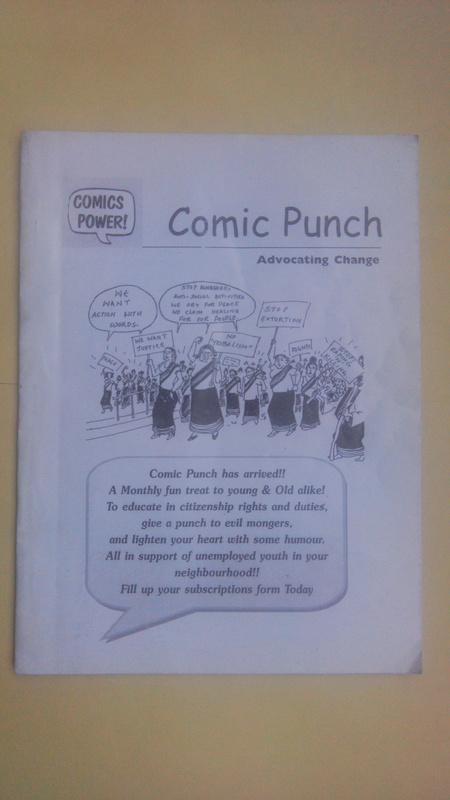 Now a punch from NagalandJ a group of youngsters from Nagaland called-‘Nagaland Grassroots Comics’ has starts this magazine. Edited by Ms. Wangshikokla Jamir and published by Nagaland Grassroot Comic it is the first initiative of its kind in the North-East Region. This 36 page book is filled with variety of drawings and stories on the issues of peace, gender, alcoholism, drugs and tribal identity. 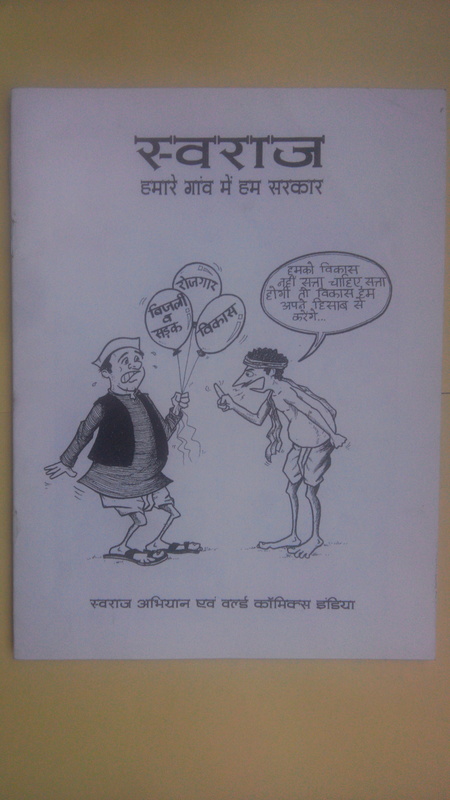 Aimed at advocating PURNA SWARAJ or SELF RULE in villages this 24 page comics book was published by World Comics India and Swaraj Abhiyaan. Swaraaj Abhiyaan is an effort which is a result of collaboration and effort of people wishing for change- a change which is brought and advocated by people themselves. They wish for SWARAJ-PEOPLE’S SELF RULE where people can take their own decisions for development or any other issue and not dependent on central authority. 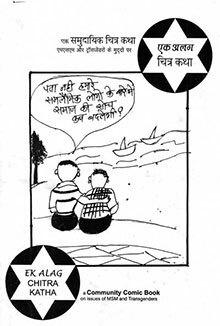 This black & white comic book talks about above issue and also provides solution of the same. This publication is in Hindi.